Another year has come to a close and this is when I like to look back at my budget for the year, see whether or not I stuck to it, and assess the consequences there-of. First of all, let’s tally up everything I bought over the course of 2010 and see whether or not I was able to stick to my budget. 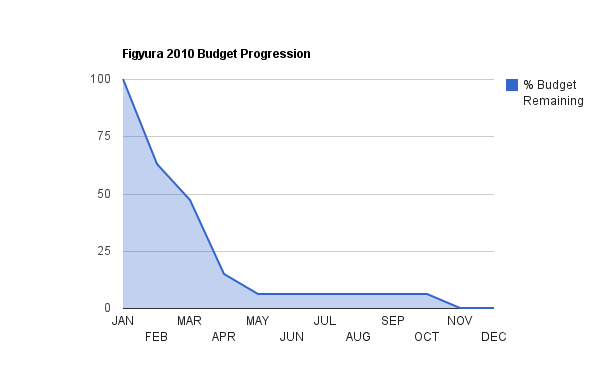 As you may recall, I set the 2010 budget at $1,500–up from $1,000 in 2009. Whew! Under budget, if only just. More insightful commentary to follow. As a reminder, all prices indicated above include shipping and any applicable proxy or credit card fees (e.g., foreign transaction fees). Now, let’s see what we can glean from the data presented above. Last year, I burned through most of my budget early in the year and had to pass on a lot of nice figures for the remainder of the year to stay within budget. I thought I had simply underestimated how much money I needed for a year’s worth of my figure habit, so I upped the budget by a cool 50% and figured the problem would resolve itself. Unfortunately, I saw the exact same scenario play out this year as the year before. Ideally, if one were to space out purchases evenly throughout the year, this would look like a roughly straight line sloping downward from January to December. But as you can see, I used more than 1/3 of my budget in the first month alone and had consumed a whopping 94% of my entire year’s budget by the end of April, which left precious little for the remainder of the year. As it would happen, this was enough for just one figure in the final eight months of the year. So, is this evidence of a systemic failure or simply good old-fashioned lack of discipline? I think it’s pretty clear now that the amount of money isn’t the problem and it has a lot more to do with me failing to divvy up my spending over an entire year. With this in mind, I’ll be rolling out some new tweaks to the budget for the coming year that I hope will finally put the issue to rest. I’ve prepared a few graphs to see if there are any particular patterns to my buying. These aren’t necessarily intended to be insightful for others, but they could still be of interest. First, let’s see if I favor any particular manufacturers. 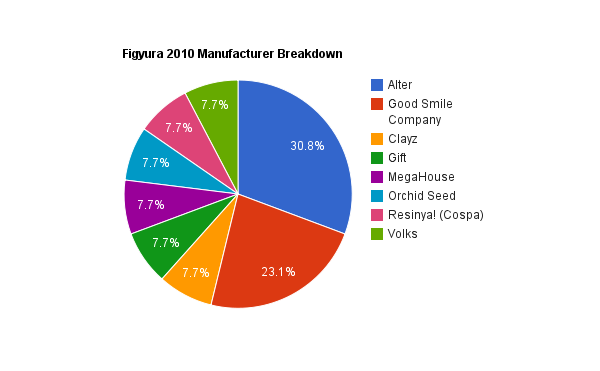 Hmm… a fair number of companies are represented here, although Alter and Good Smile Company obviously lead the way with 4 and 3 figures on the year, respectively. This isn’t terribly surprising as the other manufacturers are smaller and tend to put out less product. What could be more surprising, however, is the lack of any figures from Kotobukiya given their presence in the industry. Next, let’s look at where I like to buy my figures. 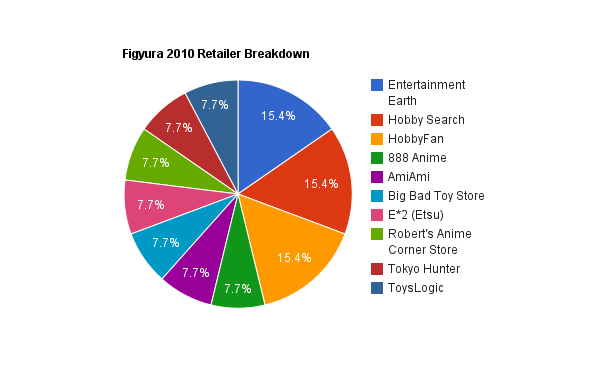 To an outsider, I imagine that this graph makes it look like I’m terribly fickle when it comes to figure shops. This really isn’t the case. Hobby Search is probably my favorite figure shop–I think they have a great site, an even better RSS feed, good selection, and they’ve never failed to fill my preorders–but they’re almost never the absolute cheapest option and I’m trying to eke the most out of my allotted budget. 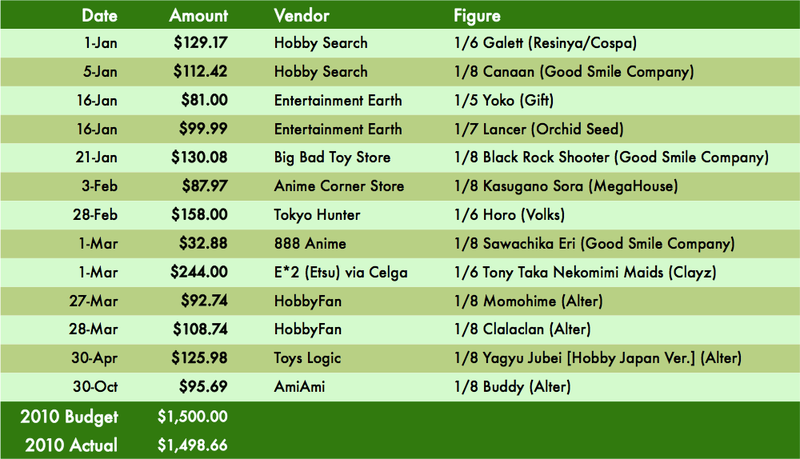 Finally, let’s see what price range the figures I bought this year fall under. 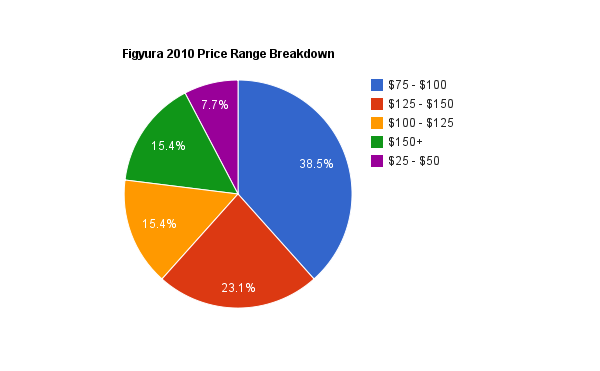 The $25 grouping is entirely arbitrary, but I think the graph gets the point across. If you’ve been collecting figures since about five years ago, this is a sad reminder of the negative impact of the weak US dollar to Japanese yen exchange rate on figure collectors. My gut feeling is that the average cost of a 1/8 scale figure has roughly doubled over the time span, although I’d like to check my numbers before stating that with any authority. I do feel that overall quality has also risen in that same time period, but certainly not at parity with pricing. Hahaha! I like that you made a post of your figure budget. It’s not just a post… its like an article..! Anyway, I got the same goal as you, quality over quantity. I believe the way the figures are presented in a room is also important. Even if you have many good pieces, it will not look good if the figures form an army on that shelf, or whatever. Especially if they’re all of different scales. I got the typical figure collector glass shelf Detolf by Ikea (and I’m from Sweden by the way heheh), And I try to keep maximum 3 figures per shelf, with matching scales. I got three on the top shelf, two on the second, three on the next, and one on the bottom. My 1/4 Mina Majikina doesn’t even fit into the shelves being too tall… I’m keeping her inside my closet until I find a way to display her. I’m thinking of making a home made glass box. but I dont know if that’d be a good idea as I’m not a professional. I need to buy another Detolf for my incoming figures Dizzy, Junko, Rin and Matabei. I’m happy to have 4 really well made figures very soon! The Market on the Dizzy figure has gone CRAZY! It was sold out on release date on every online store and people are selling her for $200 plus… sometimes even $300 even though she released out last month! I’m not too particular about how I display my figures other than trying to limit things to one row per shelf. I use the IKEA Billy shelves rather than the Detolf. It’s probably not the best shelf for figures (more wood than glass), but my shelves have to serve double duty, holding my anime DVDs and manga, too. I don’t worry too much about the value of figures I own unless I’m trying to sell. 😉 I can be very frustrating trying to pick up a popular figure post-release when it’s sold out everywhere and the price has skyrocketed, but I guess it’s one of the quirks of the figure industry. I checked your Momohime review, and was glad to know that I own both the 1st and 2nd place figure of the awards =D. I’m guessing Dizzy, Rin, Matabei or Junko will surely win. Although the two latter ones are exclusives (?). Is it hard to make your own blog? Picking up a figure post-release is definitely a double-edged sword. On the one hand, some figures end up in the bargain bin and you actually end up saving money in those cases. In my experience, though, most worthwhile figures never see the bargain bin and you will end up paying through the nose once the supply from all the front-line hobby shops is exhausted. I’m hoping to pick up UART’s 1/7 Ryofu as my next purchase and I’ve had the displeasure of watching the market price rise sharply just in the couple months that I’ve been tracking her supply. The IKEA Billy shelves have optional wood-framed glass doors which can be added at additional expense–the doors cost almost as much as the shelves!–which is what I did. They do a good job of keeping the majority of dust off my collection. Starting your own blog is not hard at all. You really don’t need to know HTML or CSS to get started. WordPress, which is where this site is hosted, and Blogger are both free blogging platforms. I can’t speak for Blogger, but I know WordPress has a nice set of administration tools that hide a lot of technical detail behind the scenes. I’m sort of eyeing SquareSpace on the side, which appears to be similarly easy to use, but more powerful. It’s a paid service, though, and I haven’t quite convinced myself that my use case justifies the cost, currently. I don’t think I have too many “unique” figures, most are kind of mainstream… well I don’t have that many figures yet to begin with.. But ouf of the 14 figures I own, I’d say, Izumi Tsubasu (Etsu), Ibuki (Megahouse), and Mina Majikina (Daiki) would be some of the figures that less blogpeople seems to own. Well.. at least what I think =). It’s good to know that Alice should be handled with care in case I buy it. I’ll probably pay extra for safer shipping or something like that. She’s out on Ebay for 170 which is the cheapest I can find her for. I don’t have money for her right now, But I’ll definately get her as soon as I can! I’m not familiar with selling on Ebay yet, but i’ll give it a try =). I got some stuff that I maybe could make some money out of. =) Like my Lineage Elf.. There was a while when there were a lot of good figures in Amiami’s bargain bin, I picked up Fate (Phantom minds ver.) and Lineage Dwarf for a really cheap price! The latter was sent as a present to a close friend, while the first had a shipping cost equal to the figure cost, so it became “avarege price” anyways -_-.. Thanks for the blog tips! I’ll probably try it out and make my own soon! Tier (Tentacle Armada) made a good and useful post about taking photos, that’d also be good knowledge for my future blog ^^.